Anything for 30 Seconds | All the World's Your Plate! All the World's Your Plate! So I started classes at New Body Boot Camp last Friday. See – even Health Coaches have goals for their own health. We’re not as “perfect” as many would think. I personally believe this makes me a better coach, because I understand that health is not a destination but a life-long journey. That may sound like a scary proposition to some, but I promise that it’s an exhilarating ride and not a punishment! But here’s the thing. I think I forgot that for a while, and so even though I have been wanting to do something like a Boot Camp for a long time…I admit I kept thinking that it would feel like some kind of punishment and that this type of exercise just isn’t “my kind of thing”. I love my yoga practice, hiking, and swimming. But regardless I had been finding myself getting bored with my regular routine and so it was becoming harder to motivate myself to keep up with it. This was just the thing I needed to shake things up – and to finally put some focus on building up my strength and stamina in new ways. I had a ridiculous amount of fun in my first class, and now with four under my belt I am completely hooked. I am re-energized, and not only around my exercise, but in all areas of my life. I’m happier, more confident, and feel physically amazing! And let me tell you – I’m eating like a CHAMP with all those extra calories burning off each day! 1. I can’t allow my commitment to helping others on their journey substitute for committing to my own. 2. I am stronger than I sometimes give myself credit for (physically AND mentally). 4. You can do anything for 30 seconds. Let me just expand for a moment on that last point. In Boot Camp, it’s not about the end of the hour or even the end of the specific circuit or routine. It’s about the 30 seconds, 45 seconds, 1 minute of whichever specific exercise you are doing. Focusing on that and only that. And putting all you have into it. The truth is, this is a lesson I can certainly apply to my own life right now. As I build a Health Coaching practice, I’m doing things I never thought I’d do. I’m learning new things every day, and yes making some mistakes along the way. I have larger goals in mind, but I can’t focus on the end of the road or think myself into paralysis wondering how I’m ever going to make it there. This week I’ve been much better able to focus on the task at hand. To focus on those 30 seconds and then move onto the next. And it’s paying off, because these small steps are leading to huge results. And this is how I will achieve my goals – mentally, emotionally, physically, and in my business. If you are in or can travel out to the Brooklyn area – I highly recommend signing up for a free trial with Aja Davis’ New Body Boot Camp. And, of course, when you are ready to reach out for support I am here at any time. Come visit me on my website, or check out my last newsletter for an amazing, affordable summer special! All of this is true for you. YOU can do ANYTHING for 30 seconds! Yay, Patti! 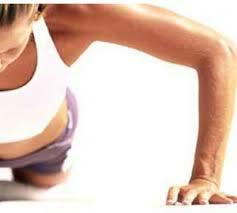 You are an inspiration….you will conquer the pushup!!!!!! So you think a BOOT CAMP will develop your creativity?